It is a well known fact that the mountain biking trails in Wales are far superior to those across the border back in England. So whilst Cranky Betty was recently enjoying an excellent womens only skills course with the wonderful One Planet Llandegla [soon to be published] I thought I would take the time to revisit the network of trails at Coed Llandegla. 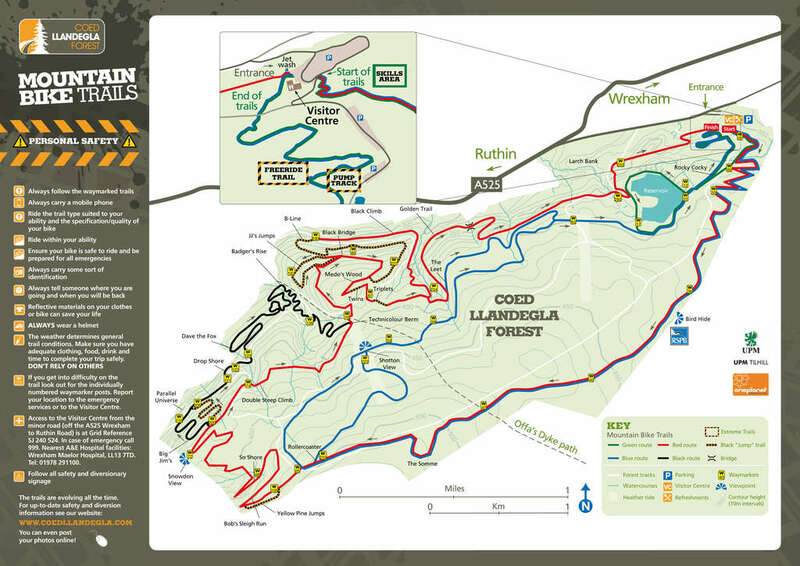 Coed Llandegla forest is situated in North Wales roughly equidistant between Chester and Wrexham, it took less than 2 hours to get there from our home in West Yorkshire, in fact it was so easy to get there that it made me wonder why we haven’t ventured across the border more often. There is a wealth of car parking (£4.50 on arrival for the day) at the trail centre, and you really should take the time to look around the excellent One Planet bike shop and cafe. If you regularly ride at locations without the benefit of a trail centre, probably because you love ‘getting back to nature’, then walking through the doors into the enormous cafe area will feel a lot like finding ‘your people’ for the first time. It is like a mini-morzine nestled in the Welsh countryside although, full disclosure there are no chairlifts in sight. The guys in the shop are really friendly, I stopped by for a quick chat and ended up getting some welcome help fine tuning my suspension set up. 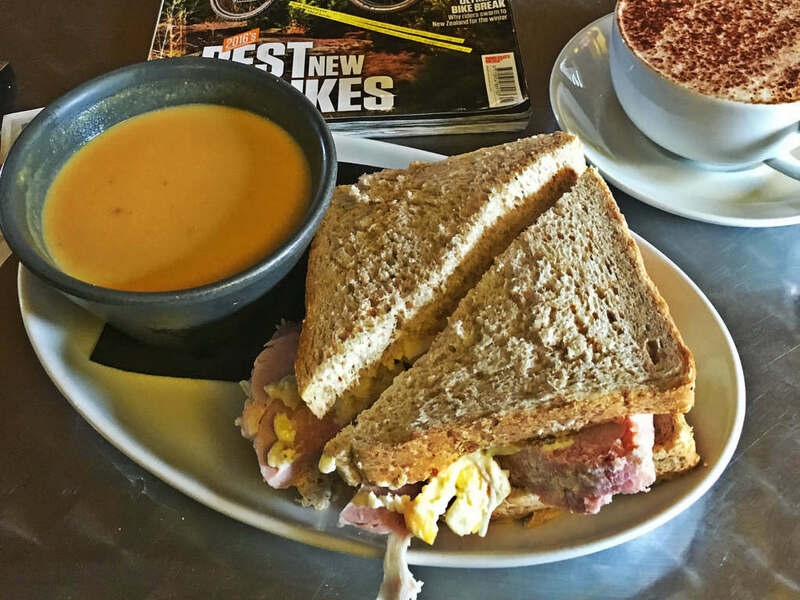 There is plenty of space to put your bikes whilst you’re enjoy a cuppa, and there are coin operated washers for cleaning down your bike at the end of the day, it is a well thought out trail centre much akin to Bike Park Wales further south in Wales. 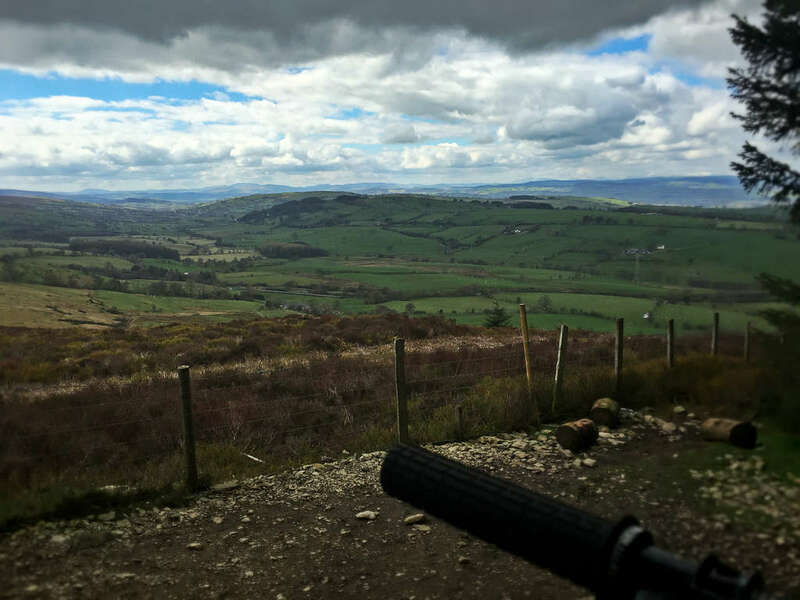 Whilst Llandegla boasts four trails (green, blue, red and black) if you’re serious about your riding then you are going to want to enjoy the red or black trails which are 18km and 21km respectively. As with many other trail centres, the black is an extension of the red trail, with some extra difficult features and jump lines for more experienced riders. Both routes begin out of the trail centre and meander up past the skills area and pump track, before subjecting you to a long and winding climb for a few miles up the mountain side which will definitely leave your legs burning by the top. The reward for the arduous climb is almost immediate as you descend through ‘Rollercoaster’, ‘Yellow Pine Jumps’ and ‘So Shore’, which leave you with the impression that the trail crew really knew how to get the most out of the terrain. The rewards don’t end there though as you come to the end of ‘So Shore’ you are in store for a beautiful view over the valleys and on a good day you should be able to see Mount Snowdon in the distance. If you can tear yourself away from the spectacular views (provided it isn’t raining) then you’re faced with the decision to go down the black trail through ‘Big Jim’ or stick to the red route which is going to reward you with an incredibly steep climb before descending slowly through the valley and eventually joining back up with the black trails on the way back to the trail centre. Given that I had a whole day to enjoy the trails I gave the red a go the first time, and then came back for the black trails, and in my view if you’re an experienced mountain biker you are really going to get the most out of the black trail. The difference between the black and red trails appears to be speed, there aren’t really any particularly technical features on the black trail at Llandegla but you will find yourself eating dirt if you’re not comfortable with fast flowing descents and jump lines involving tabletops and the occasional gap jump or drop. As I have said before the real appeal of Llandegla is it’s pace, the way the trails are designed encourages you to keep going and to flow through berm after berm. I found that as soon as the trail headed down hill I forgot about pedalling, it was quite possible to get down some of the black sections at eye-watering speed without ever having touched the pedals, not something a lot of the English trail centres can boast with any confidence. The highlight of the black route really has to be the ‘B-Line’ (perhaps named after Whistler?) which includes fast flowing north shore style ladders (they’re not as daunting as they sound) and table top after table top down the side of the hills which left me wanting to go again and again, I don’t think I can make it look as good as Neil Donoghue does in this video. Having ridden the ‘B-Line’ in both the dead of winter (-2 degrees and snowing) and a pretty warm spring day, it is unsurprisingly a damn sight more fun in the dry than it was sliding over rock slabs in late December. Another must try area is ‘JJ’s Jumps’, just before you hit the ‘B-Line’, which is a very fast flowing jump line that can be sessioned over and over again via the adjacent fire road. If, like me, if you could do with practicing your airborne skills then this is a great area to practice over and over again. I spent some time doing the tabletops before moving over to hit the gap jump lines down the trail in an effort to improve my technique. The last third of the way back to the trail centre is back on the red trail, and involves a fair amount of climbing up some steep switchbacks which leave you wondering whether it is acceptable to push up if no one is watching (it is acceptable). In terms of how to approach a ride at Llandegla the majority of riders appear to attempt it on the customary 160mm trail bikes, my Commencal Meta V4 RS no exception, which will probably be more than adequate for the red and black trails. Going above 160mm on your bike (i.e FR/DH bikes) is going to leave you struggling to make it to the top of the numerous climbs on the trails, but a lighter 120mm trail bike will still probably be fine to go round. The terrain is pretty rocky and I felt like I was never very far away from a puncture (though my Maxxis Minion’s looked after me well) and was grateful for packing a few tools and a pump. Some of you may feel comfortable traveling light, but it is a long way back to the trail centre if you’re caught short halfway round the trail. Overall, Llandegla is a fantastic trail centre for a few hours, and it will definitely challenge all but the most professional of riders. You should expect to encounter regular, steep climbs with sharp rocks and slick roots, but as soon as the trail turns down you’re going to be in for long swoopy descents with features that test your abilities and leave you with a big smile. Once you’re back at the start you should consider going back round again to hit those sections you missed, or just head to the One Planet trail hub to drool over the latest Nukeproof and Santa Cruz goodness, whilst waiting for your cappuccino and slab of cake to arrive (the coffee is really good).